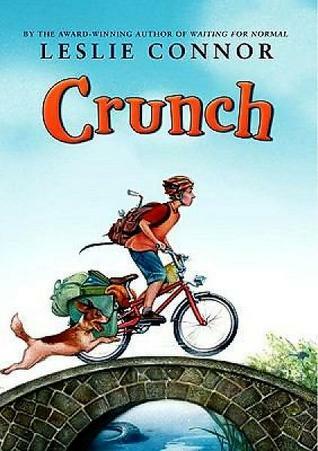 Literary Guide for Leslie Connor’s Crunch. Set in a time that is an ambiguous (yet scarily small) number of years in the future, Crunch tells the story of a family and a community dealing with life in a world where gasoline has ceased to remain available. Featuring protagonist Dewey Marriss, a 14-going-on-30-year-old bicycle mechanic, the story highlights some of the uncomfortable realities of a world suddenly without gasoline without delving deep into the true societal disintegration that would likely take place should such a thing truly happen. Author Leslie Connor’s gentle depiction of a community frantically striving to achieve self-sufficiency by any means matches the worldview and developmental stage of 10- to 14-year-olds perfectly, and beautifully intertwines the themes of independence, ingenuity, and responsibility with an examination of a world in which fuel has ceased to be available. Taking place within a small coastal community that could easily be somewhere along Massachusetts’ North Shore, Crunch begins just as the fuel has run dry. Dewey and his four siblings have been left at home alone while their parents take an anniversary trek, an annual event that puts both of them within their mobile family business: a box truck that makes deliveries along the Atlantic coast from their maybe-Massachusetts home to the furthest reaches of Downeast Maine. The Marriss siblings find themselves stuck, like everyone else, in a bit of a crunch when the gas runs out, as their stint as a parent-less (yet self-sufficient) family grows from a few days to an undefined period of time with no end in sight. Luckily for the Marrisses, their secondary family business booms as soon as the fuel runs out. With cars ceasing to be an option for transportation, local folks turn to bicycle transportation – and many find that their chains are rusty, their gears won’t shift, and their brakes are worn out. Dewey and his brother Vince have more business than they ever dreamed of at the family Bike Barn, and though they look forward to their parents’ eventual return, they revel in their success and gain confidence from their success. The longer the gas is dry, however, the busier the Bike Barn becomes. Before the brothers know it, their business is nearly out-of-control busy, and their clients become shorter on patience. During the hours when the boys aren’t busy fixing bikes and making runs for extra parts, they’re busy caring for their family’s small menagerie of farm animals as well as their other siblings – both older and younger. And amidst the semi-controlled chaos of the crunch, things begin to go mysteriously missing – both at the Marriss Bike Barn and around town. First it’s bike parts in the shop (perhaps simply misplaced? ), then it’s bikes stolen from the beach. Next it’s bicycles from a police impound lot, cash from the Bike Barn’s stash, and eggs from their hen house. Nearly dizzy from the stressful pace of his days as mechanic, caregiver, and provider, Dewey can’t decide if he’s truly missing things or if it’s the result of his own disorganization, but eventually, the clues stack up against an unsuspected thief. Using our literary guide to accompany Crunch, families can explore not only the mysteries that arise for Dewey, but the idea of self-sufficiency and their own global footprint. Critical thinking questions support the development of a deep understanding of the story, and a mini-lesson plan encourages readers to consider the perspective held by each character and the ways in which their re-tellings of important moments might differ from the narrators. Finally, ideas for extension activities highlight the need for self-sufficiency, the use of bike travel, and the role of gasoline in supporting our everyday lives (whether we drive or not). Read Crunch to begin exploring these ideas as a family! Download Literary Guide for Crunch.